Map of the proposed NoHo Historic District extension. Image: LPC. Developers and property owners oppose extension. 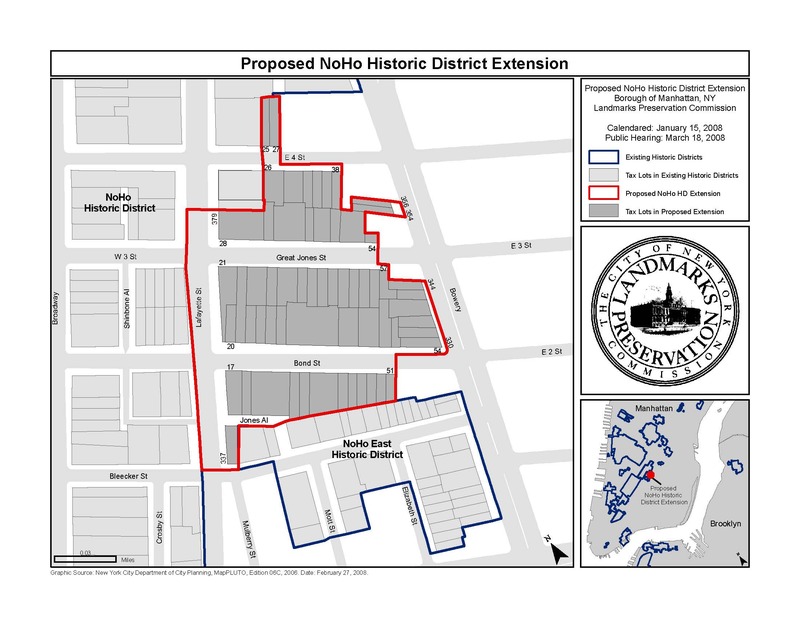 Landmarks heard testimony on a proposal to extend the NoHo Historic District to include 56 buildings, located between Broadway and Lafayette Streets from Bleecker to West 4th Street. The proposed extension includes a historically commercial area characterized by mid-19th century loft buildings, Federal- and Greek Revival-style structures, and tenements built to house local workers. The area remained almost exclusively commercial until the decline of manufacturing in Manhattan following World War II. In the 1960s, artists began to convert abandoned lofts into studios and living spaces, transforming the area into a focal point of the art world by the 1970s, with Chuck Close, Robert Mapplethorpe, and Jean-Michel Basquiat all living there at one time. At the hearing, Chuck Close testified that he had lived and worked in the area since 1967, when he took over a loft that was used for light-manufacturing. Close stated that artists had saved the area when manufacturers abandoned it, and that many artists continue to live there. Representatives from Council Members Alan Gerson and Rosie Mendez read letters in support of the proposal. State Assembly-member Thomas K. Duane and Manhattan Borough President Scott Stringer also sent representatives in support. The Historic Districts Council’s Simeon Bankoff urged Landmarks to extend the district even further because “inevitable development” would create buildings “remarkably at odds” with NoHo’s historic character. The hearing was closed without any comments from Landmarks. No date has been set for a vote on the proposal. LPC: NoHo Historic District Extension, Manhattan (LP-2287) (Mar. 18, 2008).